VDIs require specific hyper-converged systems - which one is for you? This week's newsletter is all about the new Windows 10 servicing options and what they may mean for businesses both large and small. We also have the usual tips, tools and resources for IT pros who need to keep abreast of things and be able to get stuff done. Despite all the new bells and whistles, probably the biggest change in Windows 10 as far as IT professionals concerned is no more service packs. With previous versions of Windows, Microsoft would periodically release service packs that included all software updates since the initial release of that Windows version and which occasionally also included new features. Service packs were typically released every year or so. Windows 2000 actually had four service packs released during its product lifetime, while Windows XP Service Pack 2 included some major security improvements to the platform including a much-needed host firewall, a popup blocker and security zones for Internet Explorer, new Automatic Updates settings and mechanisms, and other much-needed features for XP. But on the whole service packs usually only included fixes--new features were delayed until the next major release of the product. So why were service packs so loved by IT departments? Because they could delay installing a new version of Windows until the first service pack was released for that version. Like any other business these days, Microsoft often pushes its products out the door before they're ready, and rather than be unwitting beta testers, most organizations preferred to sit and wait for early adopters to take the heat. Then when Microsoft had fixed most of the issues with the initial release and had packaged all the fixes together as Service Pack 1, the IT department would download the new Windows image with SP1 baked into it from the Microsoft Volume Licensing website and begin serious piloting of the new Windows version with a view to deploying it. Windows Insider Program - Deploying from this branch basically lets you beta test new features before they are considered ready for prime time use. Current Branch (CB) - This is the flavor of Windows 10 that users of Windows 10 Home Edition users are basically locked into (unless they want to take a chance and participate in the Windows Insider Program). New releases of Windows 10 are expected to be provided two or three times per year for machines on this branch. These releases will include new and updated features and core applications, and Windows 10 Home machines will automatically download and upgrade to each new release as it becomes available. Current Branch for Business (CBB) - This branch is the default for Windows 10 Professional Education and Enterprise editions and it differs from CB in two main ways. First, each CBB release will appear about four months after the corresponding CB release appears first. This probably means the CBB release will include all the patches that have appeared in the previous four months to address the complaints of Home Edition users who upgraded to the corresponding CB release. And second, administrators can configure Group Policy to defer upgrade of Professional, Education and Enterprise machines for an additional eight months so they can perform testing to ensure the new release won't break existing applications and systems. However, once the eight months are up the machines on the CBB will be automatically upgraded to the new release just like Home edition users on the CB, and there's no way of stopping this from happening with CBB. Long-Term Servicing Branch (LTSB) - This branch basically follows a servicing model similar to the old service pack approach. The LTSB option is only available for Windows 10 Enterprise Edition, so you'll need a volume licensing agreement with Microsoft if you want to deploy it. And since Enterprise edition can support either the CBB or LTSB branches, there are two separate ISO images on the volume licensing site for you to choose from depending on whether you want to deploy machines from the CBB or LTSB branches. I suspect that new releases (ISOs) for LTSB will appear every couple of years or so, similar to how service packs were delivered except you might need to wipe and reinstall instead of upgrade (it's not clear at this point). One thing to note however is that these LTSB images don't include a number of Windows 10 features such as Cortana, Microsoft Edge, the Windows Store, or the Mail and Calendar apps. The reasoning behind this is probably that these features are constantly being tweaked by Microsoft, so including them would violate the raison d'etre of the LTSB. As a result, Microsoft is positioning LTSB as primarily for special use machines like point-of-sale systems, kiosk computers, and ATM machines, and they're basically pushing organizations to use CBB if they have volume licensing agreements. Windows deployment will no longer be something you think about every five years or so. Instead, you'll need pilot and test new Windows releases regularly as they appear every few months, because like it or not your systems will end up running them sooner (CB) or later (CBB). Helpdesk support for Windows 10 may be a nightmare. CBB releases may overlap for some organizations if certain departments finish their testing before others have. And employees who have Windows 10 at home and are on the CB may have apps that function differently than how those same apps function at their workplace. Training for Windows 10 will obviously be impacted as well. I mean, what's the point of developing courseware or writing a book for a Windows release that will be out of date in 4-6 months? HR departments will like throw up their hands and just say "You'll just have to figure it out on your own" to users who are puzzled by how to accomplish certain tasks on their machines. Users who are older and are therefore generally more resistant to change are going to be frustrated with using Windows 10 when they discover settings changing and apps moving around every few months when their machines are automatically upgraded to the latest release. Since I use an iPad for entertainment, I'm gradually becoming immune to such things since Apple does this type of thing regularly with their platform, but it annoys me when Windows which I use for business purposes decides to emulate Apple in this regard because I value productivity, and moving apps around or changing settings (or removing them entirely) impacts my productivity. I'm sure many of you readers can think of some additional likely consequences of the new Windows 10 servicing model. Email me at [email protected] if you'd like to share your thoughts either positive or negative in this regard. Numerous twitters complained that the Settings app in Windows 10 was woefully inadequate as a replacement for Control Panel, but Microsoft later clarified that Control Panel will be *eventually* phased out i.e. once the Settings app has full functional equivalency. It's obvious to me that the real reason Microsoft wants to eliminate Control Panel is simply to get rid of all that legacy code involved and replace it with nice shiny new code that is easier for them to maintain. Ultimately that will be a good thing. The problem however is that we'll all be experiencing several years of pain until Microsoft gets there. We're pleased to announce the availability of Windows 10 Step by Step (ISBN 9780735697959), by Joan Lambert and Steve Lambert. This is learning made easy. Get more done quickly with Windows 10. Jump in wherever you need answers—brisk lessons and colorful screenshots show you exactly what to do, step by step. Watch this course to get the latest on this fast-moving technology, directly from PowerShell inventor, Microsoft Distinguished Engineer Jeffrey Snover, and PowerShell MVP Jason Helmick! Using DSC as your management platform, you can control the deployment, maintenance, and configuration of your traditional datacenter and apply that knowledge to a hybrid environment. Following on from your quirks of Windows 10 I'd like to add a couple for you. Set up a VPN and try to change the IPv4 settings to untick the Use Default Gateway option. Then, try to use the VPN at logon. I've not found how to access it before logon yet. I am extremely interested in finding out if anyone knows how to do this because it is hampering my efforts in using VPNs because without the ability to do this, every time I make a VPN connection all other network connections are cut off. This is unacceptable. I put out a query concerning this on TechNet and got a quick reply from a user named Hessam. PowerShell to the rescue! Here's a tip from Matt Tinney on how you can import certificates using SCCM. Under each store will be a Certificates key containing the certs in a GUID form. This GUID will be same for a certificate on every computer. 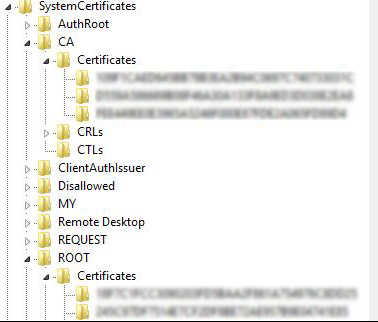 You can use a registry detection method to detect if your certificate is present. To find which certificate is added, just compare the GUIDs before and after import. Choosing the right cloud development platform is more important now than ever before—and there are two clear frontrunners for open source PaaS tools: OpenShift and Cloud Foundry. Find out the difference between the two and determine which is right for your business to commit to long term. As application containers continue to grow in popularity, IT admins have noticed they are missing one big feature: container management tools. Discover the pros and cons of these tools and whether or not they are even completely necessary. VDIs require specific hyper-converged systems—which one is for you? Finding the right hyper-converged infrastructure system can make all the difference in your virtual desktop environment, but differentiating between such similar products creates its own world of obstacles. Find out which hyper-converged systems are best for your VDI. As legacy systems become more obsolete, the way that businesses perceive and use IT is changing. Developing self-service portals is becoming the next big thing to speed up IT requests and make everyone's life easier. Learn more about service catalogs and whether you should make the decision to transition.